Darrel met his hero in 1969, Darrel’s rookie year in the Big Leagues. Darrel and the Reds didn’t have much to celebrate as they neared the halfway point of the season with a weekend series against the Chicago Cubs and Darrel’s hero, Ernie Banks. Cincinnati sat in third place in the NL West, 2.5 games behind the division leading Atlanta Braves but playing just five games above .500. The Cubs, conversely, were in first place in NL East, 8 games ahead of the New York Mets. They displayed their first place prowess in the opening game, beating the Reds 14-8, with Darrel going 0-2. Darrel’s failure to reach first base kept him from experiencing the fulfillment of a dream that started nine years earlier. Darrel had better things to do and without turning to the left or the right, he ran straight home. With his books tucked under one arm and his jacket slung over his shoulder, he cleared all the front porch steps in one jump and crashed through the front door. “Hi, Mom, I’m home!” He threw his books onto the living room sofa and turned on the TV for his favorite afternoon activity, watching the Cubs play baseball. In 1956 almost all Major League Baseball games were played during the daytime. The Cubs, however, didn’t begin playing night games until 1988, so every home game was played under the sun, which was fine for Darrel. For an eager boy it was a long time to wait for the black-and-white TV to warm up. He could hear the voice of the Cubs’ play-by play announcers, Jack Brickhouse and Lou Boudreau on WGN, Channel 9, before the picture came into focus, and it only increased the anticipation. Darrel loved baseball! It didn’t matter to the young fan that the Cubs were not very good in 1956. That April, they had only won three games. In May, they “improved,” with one more win. But seven wins in two months was simply dreadful! By the end of the season, they would finish 33 games behind the Brooklyn Dodgers, who had won 93 games, about as many as the 94 the Cubs lost. The Dodgers would go on to lose the World Series to the Yankees in a seven-game classic. For young Darrel baseball was baseball, especially in April, where hope sprung eternal. In the age before ESPN and superstations with just about every game being televised, it was just great to be a Cubs fan and get to watch them on TV. The fire of Darrel’s love for baseball and watching the Cubs, was fanned by the young shortstop, “Mr. Cub,” Ernie Banks. Entering his fourth season in 1956, he was coming off an All-Star season as the starting shortstop for the National League, when he hit almost .300 while slugging 44 home runs. He finished third in the MVP voting, behind Roy Campanella and Duke Snyder but ahead of Willie Mays. Darrel was in awe of Ernie, who could do everything on the baseball field: hit for power, run the bases with speed, play with a great glove at shortstop and throw like a shot out of a gun. As a Little Leaguer, to the best of his ability, Darrel tried to copy every move and technique of his hero. Darrel couldn’t get enough of the Cubs, Ernie Banks, or baseball. “I want to make it to the Big Leagues and be a short stop like Ernie banks,” he declared to himself and to anyone else who would listen. He watched every game on TV and would scan the sports page of the newspaper the next day to check the standings and read about his team and his hero. He cut out pictures and put them on the wall of his room. Being a Big Leaguer was all he talked about, so much so, that Carlos and Ellie, his parents, Larry his brother, Mary Kay his sister and all of his friends began to notice how much this meant to Darrel. It was easy for Darrel’s dad to encourage his son’s admiration for Ernie. He knew that there were a lot of little boys who wanted to be like Ernie Banks when they got older and a lot of men wished they could play ball as well as Ernie Banks. Beyond baseball, Ernie was a man worth emulating. His attitude was unfailingly positive, no matter how abysmal a season his team was having. His demeanor and smile were contagious and his character, noble. Kids absolutely loved him because he always took time with them, looking each in the eye and asking them questions as he signed autographs. Over the next four years while playing Little League, Darrel watched as many Cubs games as he could and applied all he learned from watching Ernie to his playing. It was a good time for both players. Darrel grew exponentially in his skills as a shortstop, pitcher and hitter. Ernie Banks was becoming one of the Major Leagues’ major stars, posting impressive numbers. In 1957, he was second in home runs behind Willie Mays. In 1958, he led the Majors by hitting 47, which was five more than Mickey Mantle, and then was named National League MVP. In 1959, he duplicated the feat. The Cubs were still a sub .500 team but Ernie’s unwavering commitment and consistent performances gave Chicagoans something to cheer about and young admirers, a lot to look up to. 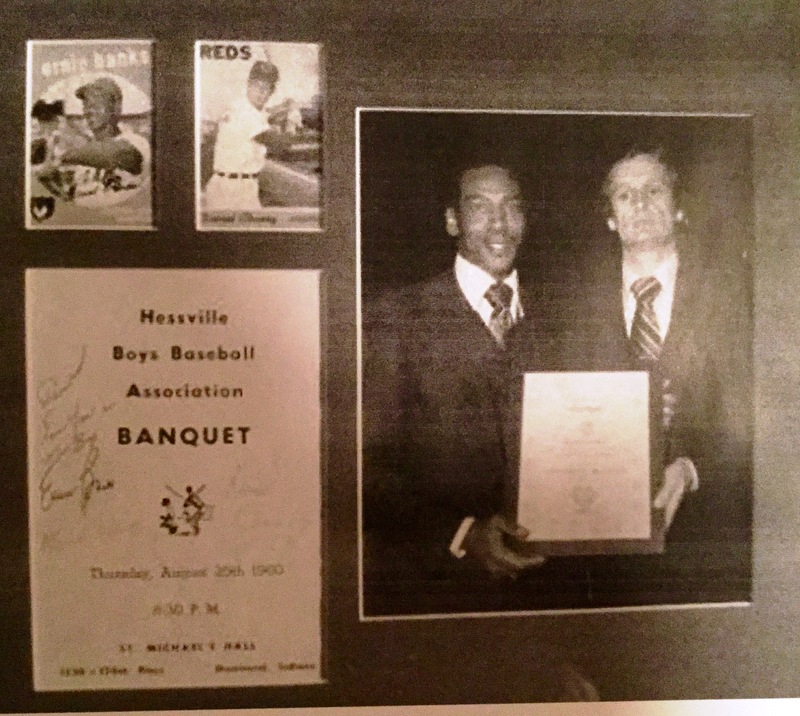 To everyone’s great pleasure, Ernie accepted the invitation to speak to the Hessville Little League at their awards banquet on August 25, 1960, in Hammond at St. Michael’s Hall. Carlos’ involvement, Darrel’s leading role on his team, and the league all-stars helped the Chaney family get seats at a table near the platform for Ernie’s speech. “I’ve waited all my life for this. Tonight I’m going to get Ernie’s autograph.” After what seemed like a lifetime, even though it was only about four years, and watching all those games on TV and a few at the stadium, Carlos’ strategy and Darrel’s dream seemed to be coming true. Ernie managed to find time for these kids and their families in his Big League schedule. After the game at Wrigley that hot August day, Ernie drove to Hammond to keep his appointment with the Hessville Little Leaguers and their families. The speech was scheduled after dinner but the empty seat beside the podium kept the eager boys, especially Darrel, too nervous to enjoy their meal. From the back of the banquet hall, when everyone was enjoying their dessert, a raucous of nervous excitement broke out. There, bigger than life, wearing a gray suit, white shirt and tie, and flashing that amazing smile, was Ernie Banks in person. Darrel stood at his table to get a better look, but his dad grabbed his arm and told him to sit down and mind his manners. “This is all wrong, Dad. Those guys in the back are getting his autograph, and I’ll never get to talk to him.” A mob of worshipping kids surrounded Ernie. He signed a bunch of programs and laughed as he maneuvered his way to the platform. The parents managed to get the boys back in their seats as Ernie passed. Darrel tried to be happy to see Ernie but couldn’t believe he would get this close and not be able to meet him or get an autograph. “Be patient, Darrel. We’ll try to get it after Ernie speaks and before he leaves,” Carlos told Darrel, trying to save the evening so Darrel could enjoy the speech. Darrel took the autographed program home and hung it next to the crucifix above his bed. Ernie’s words settled in his mind, heart and soul, and they were lived out in his actions. He played hard, worked hard, prayed hard and told the truth, so he could make it to the Big Leagues. For the next three years, Darrel played with the Tigers in the Hessville Babe Ruth League. There were no dugouts, fences or sponsors for the boys who wanted to play at the next level. They sat on a solitary bench when they were not in the field and a few parents watched from a six-step set of wood bleachers behind them. The boy who could hit a ball into the patch of woods beyond left field was awarded a home run. Darrel, a natural lefty, learned to switch-hit with the supervision and permission of his manager, his dad. It worked. He hit home runs and batted from both sides of the plate for the rest of his baseball career. Next was Hessville Post 232 of the American Legion, which sponsored the team for 16, 17 and 18-year-olds who played their home games at Hessville Park. At this age, the team experienced road games, playing other American Legion teams in nearby towns. Mr. Hankins managed Darrel’s team effectively, and with only one arm. In an accident at the manufacturing plant of American Can Company, he lost his left arm. He could still hit grounders for infield practice by throwing the ball up and grabbing the bat from under his right arm with the same hand, then swing it in time to hit hard grounders to the infielders as well as high-pops to the outfielders. The Reds drafted Darrel in the second round of the Rookie Draft, the same draft in which the Athletics took Reggie Jackson in the first round, and the Twins got Steve Garvey in the third round. Twenty two of the sixty in that draft made it to the Big Leagues. After he signed with the Reds in the living room of his home surrounded by his family, Darrel only had one day to say his good-byes. The next day at 7:00 in the morning, Dale McReynolds picked him up and put him on a plane at O’Hare airport for a flight to Sioux Falls, SD. Darrel had become a member of the Reds’ Class A Rookie League team, the Packers. He only batted .206 on a team whose average was .177 but playing at the next level was a huge step toward his dream. His first summer as a pro wrapped up in early September. After a couple weeks at home, Darrel headed to the Instructional League in Clearwater, Florida, where the Astros and Reds took their high picks, the players with the most potential, to develop their skills. Hard work and a lot of practice didn’t bother Darrel because he had a great work ethic and, after all, it was all going to help him make it to the Big Leagues. At times, Darrel would get to play with Big Leaguers because they would come down to the Instructional League to work on their timing, get some more at-bats and find a way to fit some more baseball into their year. In 1966 baseball was not a lucrative career. The dream was to play the game, travel to America’s great cities, win, and have your name included with your hero’s on scoreboards, in newspapers and on baseball cards. During the off-season, Darrel would get a job at home, in the city of Hammond. Even though he was thankful for a little money, the job only made him dream about baseball as he drove up and down the alleys of Hammond making sure people put their trash cans where they were supposed to after garbage pick-up. Darrel had a successful spring and jumped up to the AA Knoxville Smokies to play ball under manager, Don Zimmer. But his baseball season was cut short so he could serve his country in the Army Reserves. His Big League toughness and skills were developed in others ways; through basic training at Ft. Campbell, Kentucky and Advanced Individual Training at Ft. Sill, in Lawton, OK. Six months of mandatory active duty had to be completed before he could return to baseball. On Christmas day, 1967, Cindy Pajak, Darrel’s childhood sweetheart and square dancing partner, all the way back to ten years of age, agreed to marry Darrel. Their marriage in February of ‘68 began in the uncertain world of the professional baseball player. Even after missing a year of baseball, Darrel was invited to Spring training in Clearwater, Florida. When the season started, he played for the Asheville, North Carolina Tourists AA Team, managed by Sparky Anderson. In all he did Darrel’s focus remained clear. Along the journey the words of Ernie Banks connected with his commitment to work hard, play hard, pray hard and tell the truth, in order to make it to the Big Leagues. After three years in the Minors and at the end of Spring training, the suspense increased. What was the next step? Did he have what was required? Were the right people making note of his progress and, if so, would he find favor in their eyes? Was it going to be another year in the Minors? Would he go up a notch, or down? Would he even be released, return to Hammond with his new bride, and get a permanent job with the city of Hammond? On the last day of 1969 Spring Training, Darrel still did not know what was next. Manager Davey Bristol of the Big League Club scheduled meetings with Clyde Mayshore and Darrel. One more spot was available. The rest of the team already knew that they had made it, were heading for the Minors, or worse, going home. In the locker room, for Darrel and Clyde, the mood was tense. They knew that one would experience the thrill of making it to the Big Leagues and the other’s dream would be deferred. Today, one player would take the giant leap closer to his dream and the other would step back into the Minors and, perhaps, closer to the biggest disappointment of his young life. Clyde’s appointment was first. Darrel sat nervously in the locker room, with sweaty palms, dry mouth and butterflies in his stomach wondering what was going on behind closed doors. The door opened and Clyde came out crying. He tried to hide his emotions and profound disappointment. Clyde quickly made the painful walk to his locker where he packed his belongings and headed out to another season of trying to prove himself. He would not be part of a team which was getting ready to begin a Big League season filled with hope and potential. On April 11th, Darrel’s first game experience was to pinch-run for Fred Whitefield in the top of the ninth inning in the Reds’ 6-4 loss to Atlanta. On April 19th, the eighth game of the 1969 season, Darrel took the field as a Big Leaguer for the first time. Bob Aspromonte hit a grounder to Darrel who threw him out at first for his first big league defensive play. Darrel went 0 for 3 that day but he was not alone in a low performance. The Reds were shut out. Darrel’s first time with the Reds playing the Cubs was a three-game series early in June. Every game mattered but this game was at Wrigley Field. Darrel would not be in the stands watching as Big Leaguers played America’s favorite past time. Instead of sitting on the couch in his living room watching other guys on TV, he was on the field, in the game and the TV announcer was calling his name. As Cubs’ fans were arriving, Ernie Banks was down the third base line as always, spending time with the kids and giving autographs. Darrel was on the field running his warm-up sprints, hitting batting practice and getting ready to take the field, but part of his attention was still focused on Ernie Banks. Ernie’s influence had been a presence in Darrel’s life in his formative years and his climb to the Big Leagues. He looked at the autograph on his Hessville Little League program countless times, “I’ll see you in the Big Leagues.” The words and even his voice from the Little League banquet often rang in Darrel’s ears and thoughts. “When you work, work hard and when you play, play hard and when you pray, pray hard. And always tell the truth and you won’t have to remember what you say.” Darrel knew that Ernie had a significant part in his success and it felt as though he had been there through it all. It matters what people think about you, especially if it is someone you consider to be significant. Darrel wanted to find a way to let Ernie know that he made it to the Big Leagues. If Ernie could only know a fraction of how much he meant to Darrel or as Darrel hoped, remember the words he wrote to Darrel, “I’ll see you in the Big Leagues”. Darrel was only a kid then, one of a countless number of fans whom Ernie met over those nine years, one of thousands to whom he gave an autograph. Even though Ernie cared, he could not possibly remember the kid from Hammond. Players from the opposing teams did not fraternize in 1969. Darrel was going to have to meet Ernie on the field during the game but it would have to be natural, a perfect series of events. Darrel was nervous and excited at the thought of playing on the same field as Ernie. He was also a Big Leaguer now and he wanted Ernie to see that he not only made it, but that he also deserved to be there. On Friday afternoon, Darrel came to bat at the top of the second inning with two outs and nobody on base. He took one more swing with two bats, tossed one bat down and made his way to the plate. Ernie was just 90 feet away. With his heart beating so hard he could feel it, he stepped in the batter’s box for his first at-bat at Wrigley Field. He managed to contain his nerves and lay off the first pitch. With a 1 and 0 count, he jumped on the next pitch and hit a grounder which was caught on the second bounce by Nate Oliver, who then fired it to first for the third out of the inning. Tommy Helms drew a walk to open the fifth inning. Darrel took the plate, only a little less nervous but no less determined to reach first. With the count, two balls and two strikes, he went down swinging. In the sixth inning Jim Beauchamp pinch-hit for Darrel who would come out of the game. He would not get to first this game but he used his glove for four putouts in the field: a high pop-hit by Willie Smith, a line drive by Ron Santo, a double play on a grounder from Don Kessinger and a pop-fly by Billy Williams. The Cubs won 14 to 8. Saturday afternoon was a great day for a ball game. The crowd was full of excited people off for the weekend, out with family and friends, and excited to watch their first-place Cubs play baseball. Everybody around Darrel knew he was the most excited one at the ball park. Even the press knew Darrel wanted to meet Ernie. The human interest story of the kid who made it to the “Bigs” and got to play with his hero, made the sports page. But, once again, Darrel’s dream would be deferred when he led off the third inning with a ground-out to the short stop. In the top of the fifth, he missed Ernie again but he let him know he could hit when he lined a double in the gap to right field. In the top of the seventh, Darrel came up after Johnny Bench grounded out and Tommy Helms doubled to center field. In the on-deck circle, Darrel cast a glance at his proud parents who were sitting near the field on the visitors’ side. Darrel gave them the tickets he was allotted as a player and Carlos had the day off from Sinclair. His eyes filled with tears as he saw his son batting in a Big League ball game. Darrel dug in at the plate, cocked his bat and locked on Bill Hands for his wind up. His first pitch was a curve ball. Darrel hit it on the end of the bat and it was a bouncer to second. Tommy who was running was safe at third and Darrel, with good speed, in a bang-bang play, stretched to beat the throw at first. “Safe,” the umpire yelled and spread his arms out with palms down. It took Darrel ten steps to slow down and he turned into foul territory and walked back to the bag. With his left foot on first and his hands on his knees he glanced at his parents and bowed his head for a quick and simple prayer, “Thank you God for getting me here.” An arm reached around his shoulder and he looked over to see the hand that grabbed him. He thought it was the first base coach giving him instructions on what to do with runners on the corners and one out, but it was a large black hand. Darrel snapped straight up and looked his hero right in the eyes from just inches away. Then in front of 36,000 people Ernie Banks gave the kid from Hammond a Big League hug. Did Ernie remember Darrel? Did he read it in the paper or did someone tell him the story? Who cares? It didn’t matter. It was a defining moment for both of them. Ernie received the reward of living the life of a role model. Darrel experienced affirmation from his hero and the realization that he had made it to the Big Leagues.